LUCERNE VALLEY, SAN BERNARDINO COUNTY -- A mountain lion was spotted roaming around the vicinity of Arrowhead Lake Road in San Bernardino County Tuesday afternoon, animal control officers said. 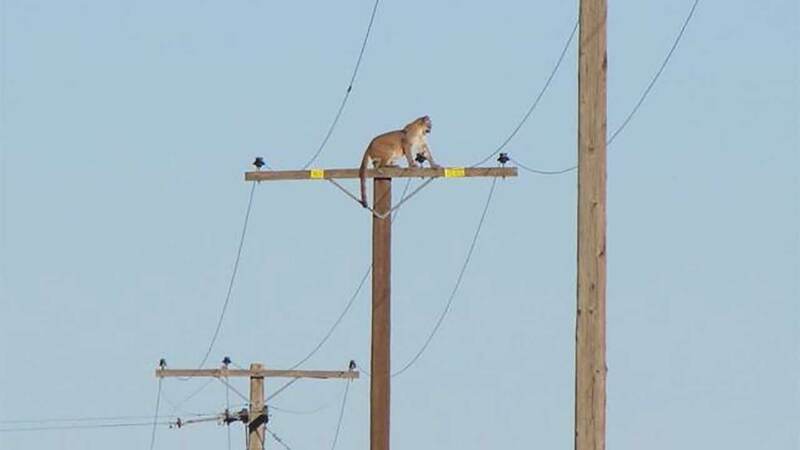 Peter Day, a staff writer with the Victor Valley Daily Press, captured a photo of the cougar, which had climbed up a 35-foot-high wooden pole on East End Road, two miles south of Cougar Buttes in Lucerne Valley. Experts said a mountain lion in search of food and water may venture into yards. Officials are warning residents to keep small pets indoors and to remove open water and food sources from yards. If you see the mountain lion, stay away and call Hesperia animal control officers immediately at (760) 947-1707.